Frank Sinatra sang “Bet your bottom dollar you lose the blues in Chicago, Chicago” – seems like a pretty solid recommendation. But don’t take Ol’ Blue Eyes word for it, after all he also sang “In Chicago, Chicago my home town” and we all know he was a Jersey boy—so go check it out for yourself! Here are my recommendations on what to do in Chicago for cultural travellers in search of great art, architecture, history, food and fun. Founded in 1879 as a museum and school for the fine arts, The Chicago Institute of Art moved into its current home in 1893 as the city wound down from hosting the World’s Columbian Exposition. The beautiful Beaux-Arts building framed by a pair of bronze lions has be extended over the years to accommodate the museum’s expanding collection which include: Seurat’s scandalous A Sunday on La Grande Jatte, Hopper’s Nighthawks, Van Gogh’s The Bedroom, Wood’s American Gothic, Chagall’s American Windows, and Motley’s Nightlife. See some of my favourites from the Institute here. The Chicago Institute of Art is situated inside Grant Park. If the weather is right, take a stroll through the Park to see landmark public art and architecture on the banks of lovely Lake Michigan. You will find a timeline of pieces ranging from the contemporary, metallic bubble of Cloud Gate completed in 2006, to the landmark, Rococo-inspired Buckingham Fountain dedicated in 1927. My personal favourite is the Ja Pritzker Pavilion designed by the incomparable Frank Gehry. While we are on the subject of art, walk south of the Institute from Van Buren St to Roosevelt Road, between State Street and Michigan Avenue, and you’ll find yourself in the Wabash Arts Corridor. The urban art project by Columbia College Chicago has been transforming the South Loop business district since 2013 by reclaiming derelict and unused spaces as a “living urban canvas”. Here you’ll find many large-scale murals by local and international street artists like Brazilian Kobra’s vibrant Muddy Waters portrait and Chicagoan Jacob Watts’ surreal image of a moose blowing pink bubblegum. Also a stone’s throw from the Institute of Art is a sign demarking the start of old Route 66. It’s highly unlikely you’ve never heard of the Route 66, it inspired a famous song recorded by everyone from Nat King Cole to John Mayer. The “Mother Road” as it’s often referred, was one of the original roads in the US Highway System running from Chicago, Illinois to Santa Monica, California. The road became the favoured path for those migrating west, particularly in the 1930s and saw many communities spring up along its path. It was eventually superseded in 1985 by newer roads of the Interstate Highway System which saw many of these small towns fade. However, sections of the Route are nostalgically designated Scenic Byways called “Historic Route 66”. Even if you don’t have the time or inclination to see a show, it’s worth taking a wander around the downtown Theatre District. 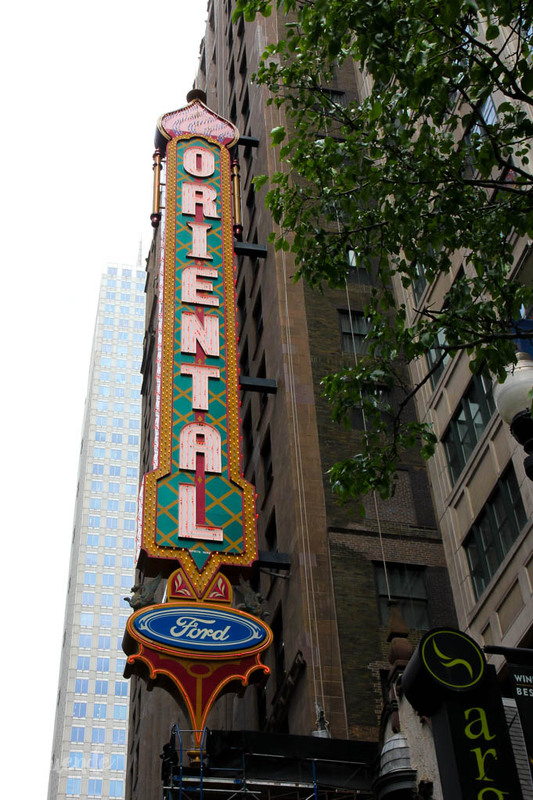 There are countless impressive architectural moments and shimmering marquees to discover such as the Chicago, Oriental, Goodman and Auditorium Theatres. The Chicago Theatre, Chicago, U.S.A.
There’s no better way to see Chicago on a warm, sunny day than to sit back on the rooftop of a boat and cruise up and down the Chicago River. 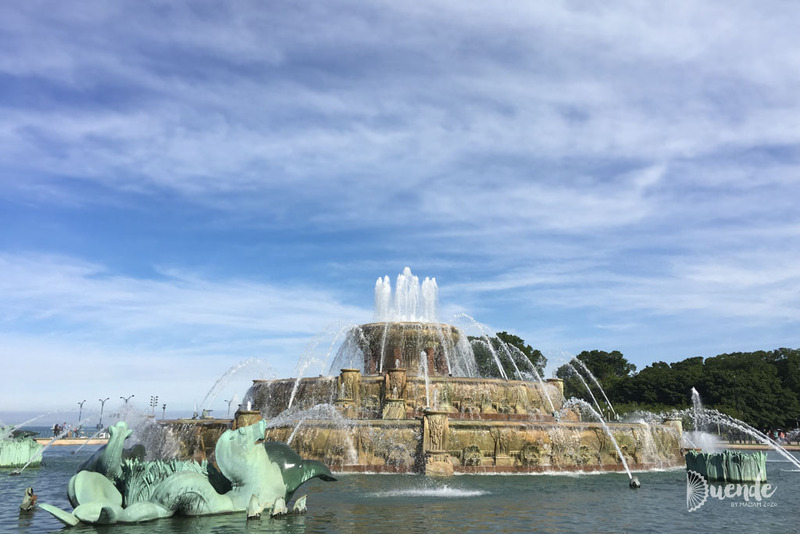 Along the way, a guide will interpret the city’s outstanding architecture and fascinating history including why the River runs backwards (away from Lake Michigan). Chicago’s premier commercial district is located on a section of Michigan Avenue north of the Chicago River. I can’t report on the shopping as rampant consumerism it’s not my cup of tea, but there are other reasons to see this part of the city. These include the amazing terracotta Wrigley Building, historic Chicago Water Tower, neo-Gothic Tribune Tower and 94-floor views over Chicago and Lake Michigan from the 360Chicago in the John Hancock Center. I’m not going to lie, on a busy day you’ll spend more time in the queue to go up and down the elevators than you’ll spend in the observatory itself but the views are worthwhile. Take a tour of renowned architect Frank Lloyd Wright’s self-designed home and studio in the outer suburb of Oak Park. You can drive, Uber or take a train from downtown to the upscale neighbourhood that contains a number of Wright-designed homes. After taking a tour of the starchitects home and studio, take walk around the historic neighbourhood with an audio tour guide. A few blocks away from Frank Lloyd Wrights home, you will also find the birthplace of Ernest Hemingway that has been transformed into a living museum. Chicago is not short on good eats. Of course, you are expected to partake in at least one deep-dish pizza (which was a lacklustre experience IMHO), and Chicago-style hot dog (ick!) but there is plenty of better fare to clean your palette with afterwards. Chicago has 22 Michelin-starred restaurants as of this post being written and many, more affordable establishments. Cupitol serves up a good, healthy, casual breakfast on the go (avocado wrap please), though unfortunately, their latte tasted like a cup of hot milk. Our lunch and dinner favourites were Jimmy Bannos Jr’s homage to pork The Purple Pig, the Nahabedian cousins’ Armenian and Greek-influenced Naha, and Rick Bayliss’ Frontera Grill. After dinner, check out the speakeasy-style bars such as tiki-inspired Three Dots and a Dash, and Watershed’s parlour style setting with craft beers, artisan spirits and wines all sourced from around the Great Lakes region. Find flights to Chicago’s O’Hare or Midway airports with Skyscanner. Search for accommodation using Tripadvisor. We found the Hilton Garden Inn (North Loop) to be a great hotel in a central location for getting around on foot. Cultural travellers, I hope you find your Windy City bliss with this guide on what to do in Chicago. Let me know in the comments below.